As readers of this blog know, I am a huge advocate of robo-advisors for automated investing due to the lack of active management and expertise that they require. After I wrote my Wealthfront Review last year, I have received a lot of questions about Wealthfront vs Betterment and which advisor you should choose to invest with. In short, the answer to this question largely depends on how much money you plan to invest, but first, we can walk through the similarities, pros and cons of each platform. Low Upfront Fees: Your first $10,000 is managed for free before you start paying fees. 529 College Savings Plan: Wealthfront offers a 529 College Savings Plan option, which Betterment does not. Direct Indexing Options: This is available for users who have over $100,000 invested and is basically a form of tax loss harvesting with individual stocks. Portfolio Line of Credit: While I wouldn’t recommend it unless you have to use it, you can take a loan out against your investment value so you can pull out cash without ceasing to invest. More ETF Asset Options: Wealthfront offers Real Estate Investment Trust (REIT) and Natural Resources funds as options in your portfolio when you invest with them. The rest of their ETFs are similar to Betterment, but these two options offer additional diversification opportunities. Better Referral Program: While one could argue for either of the referral programs, I prefer the additional dollar amount managed for free over the one month of free management as it ends up putting me farther ahead in the long run with the way that I invest. Customized goal based investing: You can set personal savings goals for different items in your future and track them independently of each other. For instance, you can save for retirement, a new home and a boat, all with different timelines and portfolio allocations. No minimum deposit: Wealthfront requires a minimum investment of $500, while you can get started with Betterment using whatever amount you would like. Fractional shares: With Betterment, you can purchase a portion of a share, so you never have money sitting idle in your account that is not invested. First month is free: If you deposit $10,000 or more, you will receive your first month with Betterment without paying fees. SmartDeposit: You tell Betterment how much money you need in your bank account at any given time and anything beyond that amount will automatically be deposited and invested for you. This is a similar idea to what you get through an app like Digit, but with higher investment upside. Tax Coordinated Accounts: Betterment will automatically look across the accounts that you have with them and move funds around to make sure that you are getting the maximum tax benefits out of both your taxable and tax deferred accounts. Annual Fee Cap: For those of us (let’s be honest, not me) that have over $2 million in assets to invest with Betterment, your fees don’t go beyond $5,000 per year, so it is a lower rate if you are investing high dollar amounts. Human Financial Advisors: Offers access to real-life financial advisors to help you, for a fee. RetireGuide Customized Investing Advice: This feature asks you roughly a couple dozen questions about your financial and life situation and offers you personalized advice based on the answers. The fee structure for Betterment is better if you are below $500.00 (since you can’t deposit in Wealthfront). For $500 – $9,999, Wealthfront wins with no fees. 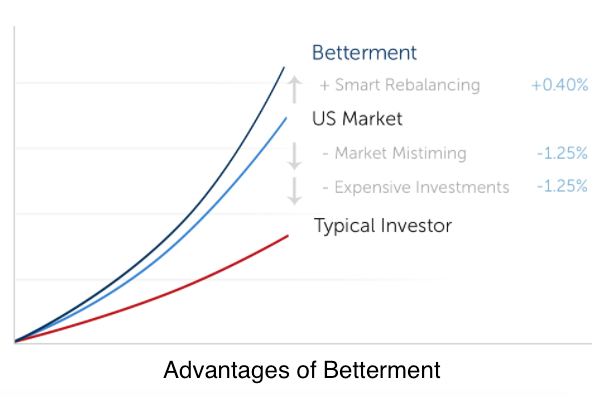 Between $10,000 and $1,999,999, Betterment and Wealthfront fees are the same. Over $2,000,000, Betterment is the winner as they cap their fees at a flat 0.25% of $2 million. When looking at the similarities and differences, it comes down to a few things to choose which option is better. Based on these criteria, you should be able to decide if you want to go with Wealthfront or Betterment. I have read a lot of reviews that fail to directly answer this question. At first, I found that annoying, but after deeply researching both platforms, I can see why it’s tough. They are so similar in so many ways and the pros and cons of each almost offset each other. If all things are equal and you plan to invest between $10,000 and $2 million with a robo-advisor, it really comes down to which platform you are most comfortable with. I prefer Wealthfront because I have been using it for longer and I am very familiar with the platform. A lot of the tools that Betterment offers are just not as useful to me personally. If you deposit under $500 or over $2 million, Betterment is the way to go. Between $500 and $10,000, Wealthfront is your best bet. In between, I would recommend trying both platforms and seeing which you prefer from an experience standpoint. Feel free to share your story or opinion on Wealthfront vs Betterment in the comments below, or feel free to contact me with questions.